Andtiques.com presents special presentation of a portion of my collection called, ~NOTHING PRINTEDS~ for Christmas 2010! These are Beautifully and Entirely Handwritten and Drawn. There is nothing printed on the tags. Each Tag takes approximately 30-45 minutes to create with some tags taking as long as an 1 - 1½ hours to create! 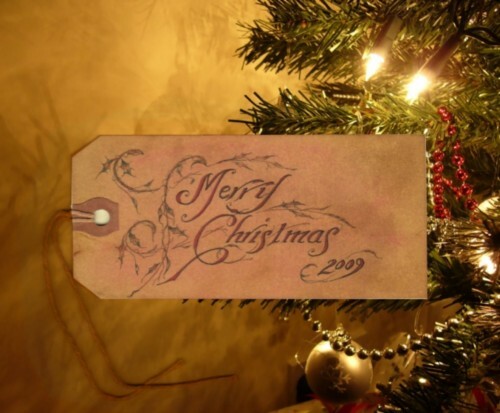 The tags are Antiquely Tea Stained and lightly Cinamon/Vanilla scented for an extra touch of Christmas. They come packaged in a plastic resealable sleeve. The tags are 4¾ inches long and 2 3/8 inches high. Each has an attached antiqued string included. They are created with very fine pen and ink, oil based colored pencils, pastel, and other medium. While the photograph scans here are accurate and pleasing, they do not show the real detail and beauty of these pieces. Here is an affordable way to present a special and personalized gift to someone special on your Christmas Gift List. I will be listing several styles and options in several different catagories of the store for the next week so be watching for my different styles of Art and Lettering. I've been A Master Calligrapher for over 25 years and those who order these come back year after year for my Christmas Calligraphy. You will too once you see one! Order plenty for your Christmas List Today! Remember, I'm listing other specialty Tags and Personalized Name Tags as well as Delicately Drawn Pen and Ink Holly Designs, so take a look at the entire Christmas Collection! Remember: There is no charge or costs for delivery to your door!